The Ouachita (Wah-Chee-Tah) National Forest is located in western Arkansas. Old timers who live there will tell you that in the late 1800’s the forest was 90% cut. Today you can’t tell it had ever been cut. 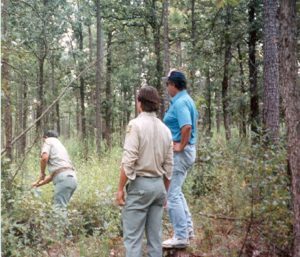 In the early 1900’s the Forest Service began managing the Ouachita and allowed the cutting of timber again by the late 30’s. It’s a beautiful forest and you can tell it has been managed well for many years. During those years eight sawmills supported the logging industry centered around Mena, Arkansas, and the Ouachita. Things were going well and the people were working. Then the environmentalists became active and in the last five years the sale of timber by the Forest Service has dropped from 190+ million board feet in 1987 to last years 64 million board feet. Six of the eight saw mills have closed and according to Tye Lewis, President of Lewis Lumber, 50% of the loggers are out of work. I went to Mena Arkansas and was the guest of the U.S. Forest Service for a tour of the Ouachita for a quick course on how they manage the forest. I was impressed with the professionalism and concern the rangers had for their job. They really care about the forest and I’m convinced the Ouachita could have never recovered from the massive cutting in the late 1800’s without human intervention. Forest Service in Ouachita Forest giving me the cook’s tour cutting a small tree to show me the rings. What it proves to me is how our forests are a reusable resource just as a field of corn or wheat is. It just has a longer growth cycle. But the length of the growth cycle isn’t a determining factor except for what an environmental activist can create with a recently cut location. No one will argue that a recently cut forest looks like massive devastation compared to an uncut location. But in time the forest can return, the Ouachita proves that. Environmental extremists know that showing the pictures of a recently cut forest can arouse the compassion, we who use forest products, have for anything that appears destroyed. They count on our compassion, and our ignorance, of what it takes to maintain the supply of wood we need and use daily in our life. In the past year, 44 appeals were made to stop the sale of trees for cutting in the Ouachita. Thirty eight have been made by one individual. An environmental extremist who works for the states environmental agency and a man who doesn’t care that six sawmills have closed and who doesn’t care human beings are suffering with the loss of their jobs. The total cost for these appeals, to the environmentalist, was the price of a 29 cent stamp for each appeal. He has helped bring the forest industry in the Ouachita to its knees for $11.02. The appeals process allows anyone to appeal a sale of trees within 45 days of the announced sale. In each case the involved person waited until the 45th day to mail in the appeal. In this way he can disrupt the system and harm the industry to the max. It is a tactic used by environmentalists all over America in all forests. To correct this obviously unfair and misused procedure the Forest Service is implementing changes to the appeals process. The bottom line change to the process, moves the time an appeal can be made from after the sale has been announced to before the decision is made. It requires the person or organization making the appeal to become part of the process before the decision is made. This eliminates the unjust simplicity that allows any frivolous appeal, and rightly so. But Ted and Jane Goebbels (Turner & Fonda) don’t like that, and in August TBS carried a series of Network Earth programs that ended with announcements of how the Forest Service is taking our right to appeal away. Earlier I stated the environmental extremists depend on our ignorance to gain their objectives. In this case Turner Broadcasting lies about how our rights are being taken away knowing the average American, watching in his living room, knows nothing about the truth. That’s why they can get away with their lies. The truth is, we need our forests but not just to look at. We use forest products in every walk of life. That means we must cut down trees! The fact is, we have more trees today then we did in 1910! The truth is, in the past 40 years, the forests that have been managed (cut) have grown by more than 20% while the forests that have not been managed, and made off limits to cutting, have shrunk by almost 10%. The truth is, the environmental agenda has nothing to do with forests or owls. It is about the elimination of all industries in America. Look at all of the attacks the environmental extremists are waging. It’s not just the forest industry. They don’t want us to build dams for electric power, they don’t want us to fish, they don’t want us to mine, they don’t want us to hunt. Locking up the forests and leaving them to a myriad of natural diseases is the worse possible thing that could happen. At the same time it’s the worse thing that can happen to the logging industry. Wyerhauser has large holdings in Arkansas as well as other parts of the country. It’s too bad that there are those of us, who will also be targeted by the environmental agenda, who are willing to “dance with the devil” for profits at the expense of their own.